Monday morning Patches and I left Louisville and headed for my Parents house in West Virginia. My car has been having mechanical issues for the last 6 months or so, and when I stopped for lunch at Dairy Queen, it died in the parking lot. A very nice man named Joe from eastern Kentucky came over and helped me look at the engine. Either it had flooded or overheated or something because after sitting for about an hour I was able to get the car started and on the road. I was afraid if I turned off the engine I might end up stranded so I left the motor running through one gas fill up and two potty breaks. I decided someone would have to be really brave to chance stealing a car that had a 70 lb dog in the front seat. 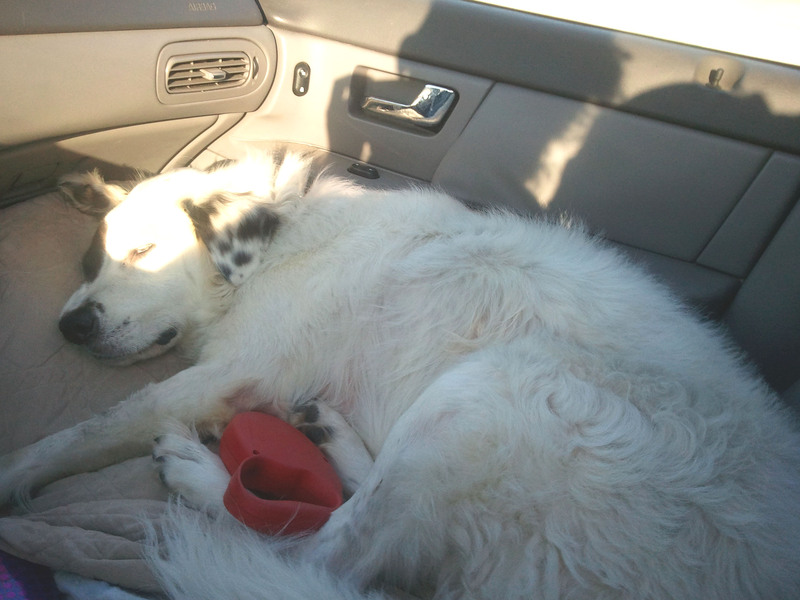 By the time we got to Mom and Dad’s we were both completely exhausted. 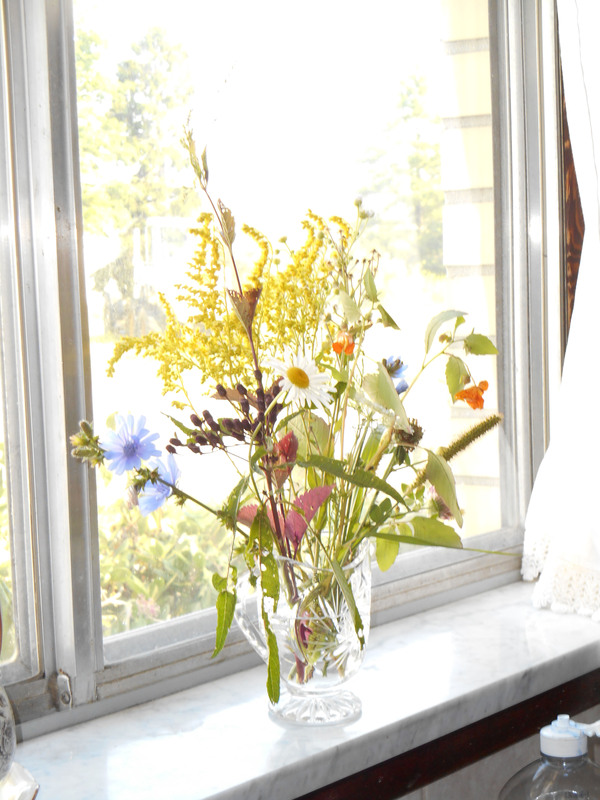 Patches and I went for a walk along one of the country roads by Mom and Dad’s house and I picked a bouquet of wild flowers. Mom had to throw my flowers away because they started dropping petals and because her allergies started acting up with the weeds in the house. They were pretty while they lasted though. I also met one of the neighbors that lived at the end of the road, a former school board member. When I told him I was headed to China for a year his advice was “stay out of the teachers lounge, don’t listen to gossip, and make up your own mind about your students”. I’ll keep that in mind. Tuesday Grandma and Grandpa came over and took everyone to a small truck stop Dive named Little Sandy’s. 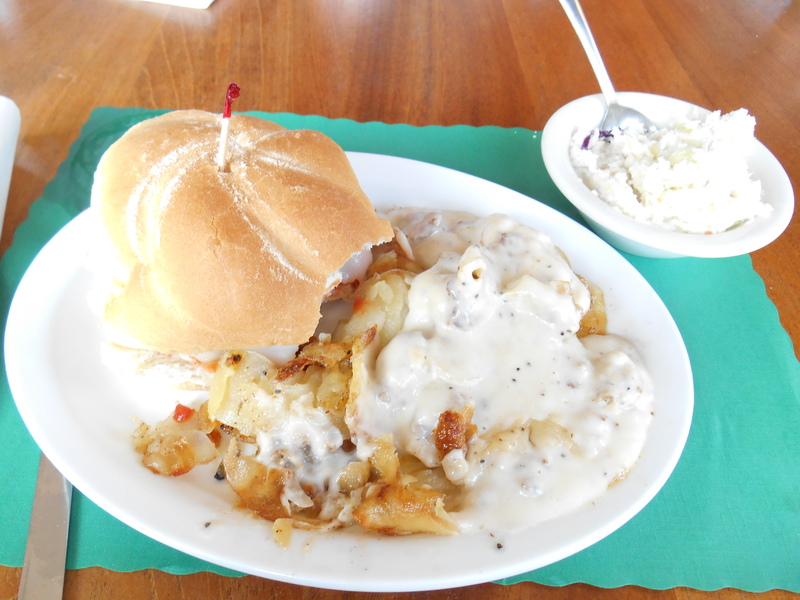 For one of my last American meals I ordered the “Lil’ Sandy Special” a hamburger with red pepper sauce, green peppers, provolone cheese and home fries with sausage gravy. The home fries were really good and they didn’t even charge extra for the flies, (and yes my Grandpa caught two flies with his bare hands during dinner). I’m in Maryland now preparing for my flight from Baltimore/Washington International on Sunday and I’m starting to really stress out about my luggage. I keep unpacking and repacking my laptop and papers in my carry-on hoping that I don’t forget anything. We went today to get my Power-of-Attorney notarized, among other errands. I dropped Patches off at my brother Tim’s house last night where he will be living for the next year or so. I cried a little thinking about not having him around for early morning walks and to come home to at night. It may seem funny but I think I’m going to miss Patches more than some people that I’m leaving behind. I’m starting to get super-excited and a little nervous about flying out, and I’m stressing out about all the loose ends I have to tie up before I go. A lot of other English Teachers for this fall have already prepared their introductory lessons, which I have not even thought about, I have a really good teaching book called “The First Day’s of School”. It has a lot of great suggestions about classroom management and setting up rules during your first day of class. I’d also like to think of some introductory games or activity for the students for Day 1. If anyone has some suggestions on a Get-to-know-you Activity please let me know. Next Post Coolest day Ever!!! to work on your first days lesson on the plane. I hope you have a safe flight! Remember when you have that 5 hour layover to let me know how things are going and text me lots of pics! !